Broad bean fits sustainable agriculture model due to symbiosis with Rhizobium, the seeds being a good source of energy, proteins, polyphenols, and fiber. The large amount of broad bean biomass residues can be employed for biofuel production, thus valorizing the overall production process. This research was aimed to investigate on the effects of farming management, such as greenhouse cultivation and appropriate planting time on the qualities of broad bean seeds and residual biomass for conversion into biofuel. The related balances of energy gain associated to both ethanol yield and nitrogen fertilizer saving due to Rhizobium nitrogen fixation were assessed. Research was carried out on broad bean in Portici, province of Naples, southern Italy, based on the factorial combination of two farming systems (open field, greenhouse) and five planting times: 27 September and 11 October, to obtain early production; 25 October, which fell in the usual period for broad bean planting in the province area; and 8 November and 22 November, for late production. For each of these cultivation conditions, the quality of seeds, in terms of protein, fiber and antioxidant concentrations, and of crop residual biomass were determined. In addition, the energy yield as ethanol production from residual biomass and nitrogen fertilizer saving due to Rhizobium atmospheric fixation were assessed. The highest plant nitrogen uptake was recorded under the fourth planting time in open field and the third in greenhouse, the average accumulation attaining 87% in residual biomass, 7.4% in pods, and 5.6% in seeds. Seed protein content was 12.6% higher in greenhouse than in open field and 16.2% higher under the latest planting time compared to the earliest one. Seed polyphenol concentration was higher in open field than in greenhouse and with the two earliest planting times. Greenhouse grown biomass showed higher values of lignin, hemicellulose and pectin, compared to open field, whereas the opposite trend was for cellulose. Lignin showed a decrease from the first to the last crop cycle, opposite to cellulose, and glucose was the most represented monosaccharide. Both the highest theoretical ethanol and overall energy production were highest with the fourth planting time. Greenhouse management enabled broad bean plants to accumulate higher proteins in seeds, but open field conditions resulted in better residual biomass quality for ethanol and Rhizobium-depending energy production. Broad bean (Vicia faba L.) is a vegetable crop grown worldwide, mainly in Mediterranean basin, United Kingdom, eastern Europe, China, India, South America, Australia, with a total surface area of 240,000 ha ; Italy is a major European producer, with 49,000 hectares devoted to this crop . Broad bean shows features fitting sustainable agriculture model , as it benefits from symbiosis with Rhizobium bacterium to fix nitrogen from the atmosphere. Root Rhizobium-containing nodules build up upon phenol root secretion attracting microorganisms , depending on plant environmental and growth conditions . Notably, plant phenolics act as signal-molecules, inducing the nodulation factor biosynthesis and Rhizobium infection . However, under unfavorable conditions for symbiosis triggering allelopathic substances in root exudates exert a control activity of Rhizobium infections, reducing the bacterium reproduction rate in host plant rhizosphere . Broad bean seeds represent a remarkable energy source, providing 44 kcal 100 g−1 of fresh seeds, and they are rich in fiber, lysine rich proteins, mineral nutrients, vitamins, and antioxidants . Notably, the high fiber concentration is essential for intestinal functions regulation as well as for blood glucose and cholesterol control . Polyphenols act as antioxidants as well as protective screens against ultraviolet radiations  and they are highly present in the seed tegument . However, polyphenols excessive accumulation relevant to cell requirements can potentially damage lipids, proteins, and nucleic acids promoting chronic diseases such as cancer, cardiovascular or neurodegenerative problems . Broad bean is mostly grown under field conditions, but greenhouse environmental conditions may allow for an effective prevention of environmental unbalances . Planting time is also crucial in Vicia faba management in order to maximize seed quality, as it is strictly matched to the growing environment and even affects the crop cycle in terms of possible occurrence of abiotic and/or biotic stresses . Large amounts of broad bean biomass residues are left on the field after pod harvest, which can be employed for different uses, such as biofuels and biogas  or high value chemicals, thus valorizing the overall production process. These residues account for 42.3–50.5% of the total crop biomass and are characterized by high polysaccharide content and low lignin (48.8–56.5% biomass fraction and 13.1–14.4% biomass fraction, respectively) which have effects on lignocellulosic biomass processability [15, 16]. Indeed, the production of biofuel from biomass residues represents a valuable opportunity to avoid concerns about compromising food supply by using starch- or sucrose-based feedstocks and it is advantageous from economic, environmental, and strategic points of view . The goal of this research was to assess the effect of farming systems and planting time on: (i) the quality of seeds, in terms of proteins, fibers and antioxidants, and crop residual biomass, (ii) the nitrogen uptake and partition in plant parts, (iii) the energy yield as ethanol production from residual biomass, and (iv) nitrogen fertilizer saving due to Rhizobium atmospheric fixation. Broad bean (Vicia faba L. major Hartz)) cultivar Aguadulce supersimonia was grown in Naples, southern Italy (40°50′ N, 14°15′ E, 17 m a.s.l. ), in a Mediterranean climate, in 2011–2013 on a sandy-loam soil field (76.2% sand, 15.8% silt, 8% clay, 1.9% organic matter, 0.11% total N, pH 7.2, 340 µS cm−1 EC); the trend of temperature and PAR are shown in Fig. 1. Comparisons were made between ten experimental treatments, obtained by the factorial combination of two farming systems (open field, greenhouse) and five planting times (27 September, 11 October, 25 October, 8 November, 22 November). A split plot design with three replicates was arranged, where each elementary plot was 6.00 m2; plants were transplanted in single rows spaced by 85 cm from each other and the spacing was of 13 cm along the rows, with an areal density of 9 pt m−2. Planting times were chosen in order to assess the effects of earlier and later transplant dates, referred to the common planting date of 25 October in Naples province, on the quality of seeds and of residual biomass as well as on Rhizobium nitrogen fixation. Greenhouse consisted of a three-span polytunnel, each span being 30 m long, 5 m wide, 2 and 3.5 m high at wall and at roof, respectively. Each year the plants were supplied with 90 kg ha−1 of N, 75 kg ha−1 of P2O5 and 200 kg ha−1 of K2O. Nitrogen and phosphorus were just given before transplanting by using the 6–8–18 Timac fertilizer integrated with ammonium sulfate, in order to counterbalance the slow initial growth of Rhizobium and improving nutrient absorption . Potassium supply was completed on dressing by potassium sulfate application. Drip irrigation was activated when the soil available water capacity (AWC) decreased to 80%. Pod harvest was performed every time the seeds had completed their growth, starting with the first planting time and ending under the fifth transplant, from 6 February to 10 June in greenhouse and from 18 February to 16 June in open field, as an average of the 2 research years. The soil nitrogen content was assessed in all treatments, at the beginning and end of each crop cycle, in order to determine the contribution of this source to the total plant uptake of this element. Determinations of nodule number were performed on broad bean roots taken at 0–30 cm depth, and primary roots were used for characterizing Rhizobium and assessing its efficiency. Rhizobium were isolated from fresh nodules according to Vincent method  and the bacterial strain was verified as recommended by Graham et al. , after which they were incubated at 28 °C and kept at – 20 °C in YM brodo con 25% (v/v) glycerol. Rhizobium genomic DNA was extracted using InstaGene Matrix (Bio-Rad Laboratories, Hercules, CA) and the gene NODC was amplified by nodCf and nodCf primers . A PCR mixture as well as Rhizobium leguminosarum bv. viciae LPR1105 and Rhizobium leguminosarum bv. viciae VF39 were used as positive controls . Random plant samples were taken in each plot at the developmental phase, vegetative growth (V), early flowering (Fl), early fruiting (Efr), mid fruiting (Mfr), late fruiting (Lfr), both in open field (OF), and greenhouse (G). Roots of the collected plants were detached and the aerial fraction was separated in its parts: vegetative biomass, pods, and seeds. Each part was dried at 60 °C up to constant weight and after pulverized, Nitrogen of the sample powders of vegetative biomass and pods was determined by HCNS elementary analyzer (EA 1108, Fisons) in triplicate. Nitrogen in seeds was determined as described in the next section. Broad bean pods were randomly sampled in each plot, and immediately transferred to the laboratory, where the seeds were extracted from the pods. From each seed sample, 50 g of seeds was randomly drawn out and homogenized with a blender in liquid nitrogen for the determinations of ascorbic acid in triplicate and of soluble solid content in duplicate. Other 50 g of seeds was frozen, lyophilized, and then ground for the determinations of fiber, protein and total polyphenol contents in triplicates. Soluble solids, expressed as Brix at 20 °C, were assessed using a Bellingham and Stanley digital refractometer, model RFM 81. Ascorbic acid was assessed according to Kampfenkel et al. , total polyphenols as previously described . Fiber and proteins were determined using a chemometric method, with principal component regression method (PCR) applying near infrared spectroscopy (NIR). For PCR calibration parameters, the fiber and nitrogen contents were determined for 20 samples. Fiber was determined on the washed and dried residue from 1 g of lyophilized seeds extracted with petroleum ether and then hydrolyzed for 30 min in 100 mL H2SO4 0.5 M at boiling point; nitrogen was determined by HCNS analyzer (Fisons EA 1108) in triplicate. Spectra between 4000 and 10,000 cm−1 of powdered seeds were obtained in reflectance with a NIRA accessory on a Perkin Elmer Frontier infrared spectrophotometer equipped with Spectrum software and chemometrically processed by Quant+ software, both from Perkin Elmer. The PCR parameters for fiber and proteins were, respectively, as follows: number of principal components, 5 and 4; R2, 91.0 and 87.2; SEE, 1.706 and 1.395; SEP, 2.176 and 1.983; and means, 26.6 and 30.3. The protein content was obtained as nitrogen multiplied by 6.25. After harvest, plant residual biomass was cut off at ground level, including leaves, shoots, stems, and immature or damaged pods. The waste showed no fungal symptoms, and therefore samples were randomly collected in each plot and immediately transferred to the laboratory, where they were dried in an oven at 70 °C under vacuum, at 15 kPa pressure, until they reached constant weight. After assessing the dry residue, the whole samples were carefully milled using a laboratory mill, avoiding segregation of materials belonging to different plant parts. The final material, composed of particles ≤ 1 mm diameter, was stored in air-tight bags at – 20 °C and further dried just before being processed. Determination of lignin was performed by acetyl bromide method. Briefly, 4 mg of pulverized biomass was treated with 0.25 mL of acetyl bromide in glacial acetic acid (1:3 v/v) at 50 °C frequently vortexing for 3 h. After cooling, the mixture was recovered with 1 mL of NaOH 2 mol L−1, then added with 0.17 mL of hydroxylamine HCl 0.5 mol L−1 and diluted with glacial acetic acid before absorbance measurement at 280 nm for lignin quantification that was performed using Beer’s Law with 15.69 L g−1 cm−1 as extinction coefficient. Contents of cellulose, hemicellulose, pectin, crystalline cellulose, and non-cellulosic monosaccharide were performed in compliance with a previous study , as reported in the following. Holocellulose was determined by delignification of biomass dry powder (7.5 g) for 3 h at 75 °C in a mixture (240 mL water, 0.75 mL glacial acetic acid and 2.25 g sodium chlorite) to which further acid and chlorite amounts, equal to previous, were hourly added. The resulting holocellulose residue was dried at 105 °C and weighed after washing with cold water, warm water and acetone. The pectin content was determined by holocellulose weight loss after pectin extraction. For this, holocellulose (1.3 g) was treated at 75 °C with potassium acetate 0.6 mol L−1 (26 mL), and adding ammonium oxalate 0.04 mol L−1 (26 mL) after 3 h. The suspension was filtered, then the residue was washed, dried at 105 °C and weighed. Cellulose was isolated from holocellulose (3.8 g) by treatment with sodium hydroxide 4.4 mol L−1 (100 mL) for 30 min. The filtered residue of cellulose was washed with warm water, acetic acid 2 mol L−1, and water, then dried at 105 °C and weighed. The hemicellulose was calculated as holocellulose minus cellulose and pectin. Cellulosic monosaccharide was determined by hydrolysis of biomass dry powder (4 mg) treated with trifluoroacetic acid, TFA, 2 mol L−1 (0.5 mL) in argon fluxed vials at 100 °C for 4 h. The pellets, resulting by drying vials in centrifugal evaporator, were washed with 2-propanol, vacuum dried and water resuspended, then filtered with 0.45 mm PTFE filters and analyzed by HPAEC. Crystalline cellulose was determined by hydrolysis with 72% sulphuric acid (90 mL) for 4 h of the TFA hydrolysed pellets obtained as above and washed with water and acetone. The hydrolizate was added of 1.89 mL water and heated for 4 h at 120 °C, then glucose was assessed in supernatant by anthrone method. Plant nitrogen uptake was assessed as the nitrogen of the whole aerial biomass (sum of the nitrogen in vegetative parts, pods and seeds) and it was determined at each phenological phase by HCNS elementary analyzer (EA 1108, Fisons) in triplicate, as described in previous sections. The estimation of nitrogen fraction arising from Rhizobium fixation was obtained from the ratio between the plant nitrogen accumulated at each phase and the nodule numbers as mean of nodules determined at contiguous phases. The theoretical ethanol yield respect the biomass was calculated considering the total cellulose conversion in the sample, according to the National Renewable Energy Laboratory standards [26, 27] and the following formula was used: cellulose conversion = ([EtOH]f − [EtOH]0) × (0.51 × f × [Biomass] × 1.111)−1, where [EtOH]f is the ethanol concentration at the end of the fermentation minus any ethanol produced from the enzyme and medium; [EtOH]0 is the ethanol concentration at the beginning of the fermentation which should be zero; [Biomass] is the dry biomass concentration at the beginning of the fermentation (all concentrations are in g L−1); f is the cellulose fraction by weight of dry biomass; 0.51 is the conversion factor for glucose to ethanol based on stoichiometric biochemistry of yeast; 1.111 converts cellulose to equivalent glucose. The theoretical ethanol yield was reported taking into account the biomass yield per surface area unit. The energy amount associated to ethanol was calculated by multiplying its yield expressed in L ha−1 by 21.4 MJ L−1 ethanol . The energy gain relevant to Rhizobium atmospheric fixation was obtained from the fixed nitrogen amount multiplied by 78.2 MJ kg−1 needed for producing mineral nitrogen fertilizer . Data were processed by two-way analysis of variance and significant main effects as well as interactions were reported. Mean separations were performed through the Duncan multiple range test, with reference to 0.05 probability level, using SPSS software version 21. Data expressed as percentage were subjected to angular transformation before processing. Correlations were performed with all pairs of chemical parameters using the software mentioned above. As shown in Table 1, the highest plant nitrogen uptake occurred under the fourth planting time in open field and the third in greenhouse, whereas the lowest absorption corresponded to the latest transplant in both farming systems. With regard to nitrogen distribution among the different plant parts, the highest accumulation in the residual biomass was recorded in the earliest crop cycle; differently, the pods and the seeds attained the highest nitrogen concentration in the fourth planting time under open field conditions and with the fifth transplant in greenhouse. In the seeds, the protein content (Table 2) showed a 12.6% higher concentration in greenhouse than in open field and a 16.2% increase from the first to the last planting time. The protein concentrations recorded in our research fell within the range reported by other authors . Notably, this quality indicator content showed increasing trends with the temperature rise; indeed, protein biosynthesis in faba bean seeds is affected by the interaction among genetic, cultural and climate factors  and it is quite intensive during the storage phase of seed development. The latter is characterized by a switch in cotyledon metabolism from cell division to cell expansion as well as by endopolyploidization  and the beginning of storage protein accumulation is linked with a sucrose signal originating from the onset of sucrose/H+ symporter activity . Within the two major storage protein classes, the synthesis of vicilin starts about 21–24 days after flower anthesis and ceases about 7–10 days later whereas the synthesis of legumin begins about 4 days after vicilin synthesis . In legume seeds, there are structural linkages between proteins and fibers, affecting seeds nutritive value which is connected to the availability of proteins digested and absorbed in the digestive tract. In fact, a significant protein percentage (23–43% of total proteins) remains insoluble and less nutritionally available, as it is connected to the insoluble fiber fraction . Indeed, the proteins linked to insoluble fiber components (cellulose, hemicellulose, and lignin) are not hydrolysed into lower molecular weight compounds such as small peptides and amino acids . Fiber was also significantly affected by farming system, as its content was higher in greenhouse grown seeds than in the open field ones, and it gradually increased from the earliest to the latest planting time (Table 2). In previous research, lower fiber levels were reported in faba bean seeds compared to those detected in our research . Dry residue and soluble solids of faba bean seeds were not affected by farming system (Table 2), but they increased with the transplant delay. Total polyphenols content (Table 2) was higher in open field grown seeds than in the greenhouse ones (301 vs. 254 mg g−1 d.w., respectively). Moreover, polyphenols were more concentrated in the seeds obtained with the first and the second transplant (317 mg g−1 d.w. as an average), whereas no significant differences were observed in the later cycles (250 mg g−1 d.w. as an average). Notably, in our research, the seed polyphenols contents displayed opposite trends to the ones recorded for proteins and they fell in the range reported by . These compounds reportedly show a positive correlation with the antioxidant activity [10, 38], whereas the correlation with temperature is controversial, as it resulted positive in banana and tomato [39, 40] but adverse in lettuce and watermelon [39, 41]. Phenylalanine ammonium-lyase (PAL) is considered the main enzyme in the phenyl-propanoid building pathway, catalyzing the l-phenylalanine turning into trans-cinnamic acid, which is the intermediate compound in phenolic biosynthesis . This enzyme activity increases in response to thermal stress and it is considered one of the main cell acclimation symptoms against stress . On the other hand, phenol oxidation is performed either by peroxidases (POD) or priority by polyphenols oxidases (PPO); the latter enzyme catalyzes the oxidation of o-diphenols to o-diquinons, as well as monophenols hydroxylation . Both enzymes have been associated with physiological damage caused by thermal stress and, in fact, under high or low temperature stress these enzymes are activated, whereas the enzymes oxidizing the same compounds are inhibited [43, 44]. Accordingly, soluble phenolic compounds can accumulate as a mechanism of acclimation to overcome high or low temperature stress . 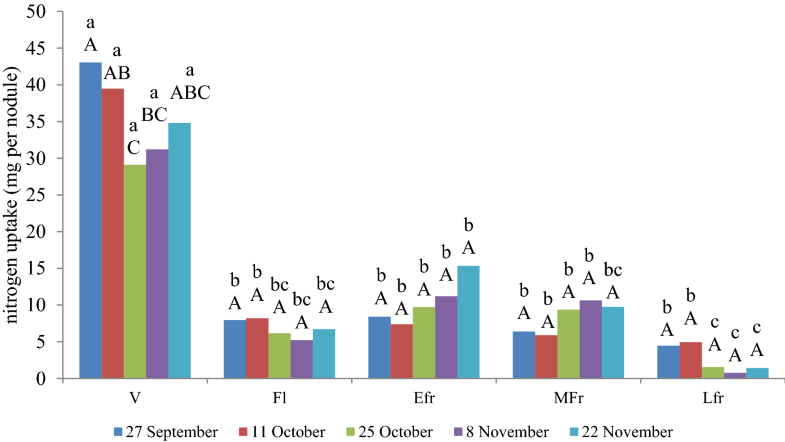 Ascorbic acid concentration (Table 2) was 57% higher in faba bean seeds grown in open field than in the greenhouse, increasing from the first to the third planting time (542 and 656 mg g−1 d.w. respectively), after which it remained steady up to the last crop cycle. In our research, conversely to polyphenols whose biosynthesis was activated by thermal stress, ascorbic acid was affected by light intensity, as its content was higher in open field and increased with the transplant delay. However, with regard to the connections between these two antioxidant compounds,  reported the important role of polyphenols in preventing enzymatic degradation of ascorbic acid. 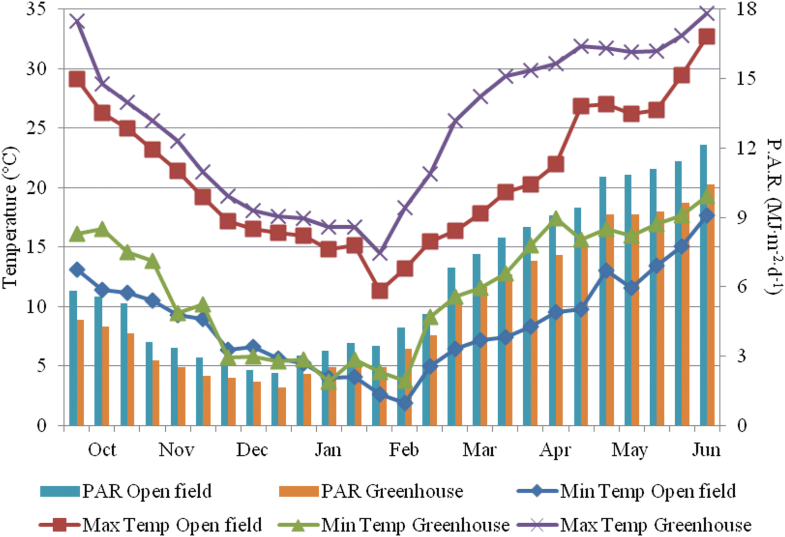 The interaction between farming system and planting time was significant on broad bean residual biomass yield (Table 3), which attained higher values in open field than in greenhouse in all the crop cycles, except for the latest planting time, in which it did not show differences between the two farming systems. In open field, biomass showed an increasing trend from the first to the fourth planting time and then the biomass yield dropped. In greenhouse, the highest biomass was recorded with the third and the fourth transplant. In previous research  broad bean biomass grown in Australia showed a decreasing trend with the planting delay, which was similar to that recorded in our research. As for cell wall chemical composition of broad bean residual biomass (Table 3), greenhouse crops showed significantly higher values than the open field ones with regard to lignin content (16.4 vs. 15.3%), hemicelluloses (15.1 vs. 13.9%), and pectin (13.4 vs. 12.5%). Open field grown biomass showed higher cellulose content (44.5 vs. 46.0%), whereas no difference in crystalline cellulose was detected between the two farming systems. In previous investigations, [14, 28] lower lignin and cellulose but higher hemicellulose percentage in broad bean biomass grown in open field were reported. As regards the planting times, the lignin content showed a gradual decrease from the first (17.7%) to the last crop cycle (13.7%); similar trend was recorded for pectin (from 14.1 to 11.5%). Conversely, cellulose and crystalline cellulose percentage increased with the planting delay (from 41.1 to 48.7% and from 10.9 to 13.0% for cellulose and crystalline cellulose respectively), whereas hemicelluloses were not affected by the planting time. Consistently with our findings,  reported a decrease in biomass lignin and hemicellulose content with the planting delay in spring grown sorghum. In the present work, lignin showed positive correlation with pectin (r = 0.61 at p < 0.01), but a negative correlation with total cellulose (r = − 0.73 at p < 0.01) and with crystalline cellulose (r = − 0.68 at p < 0.01). Total and crystalline cellulose, in turn, were positively correlated to each other (r = 0.72 at p < 0.01), but negatively correlated with pectin (r = − 0.59 at p < 0.01 and r = − 0.63 at p < 0.01, respectively). Finally, no examined component showed significant correlation with hemicellulose. The monosaccharide composition in the hemicellulosic fraction is showed in Fig. 2. Glucose is the most represented monosaccharide (46.7%), followed by xylose (27.4%) and galactose (9.9%), whereas glucuronic acid and fucose were detected in traces. Similarly to our results, in previous research  the prevalence of glucans and arabinoxylans was detected in broad bean hemicellulose. Some sugars decreased from the first to the last planting time, such as arabinose (from 6.8 to 6.2%), glucose (from 45.9 to 43.2%), and rhamnose (from 2.8 to 2.3%); galacturonic acid and mannose increased with the planting delay (from 4.5 to 6.4% and from 3.9 to 5.5%, respectively); galactose and xylose were not significantly affected by planting time. 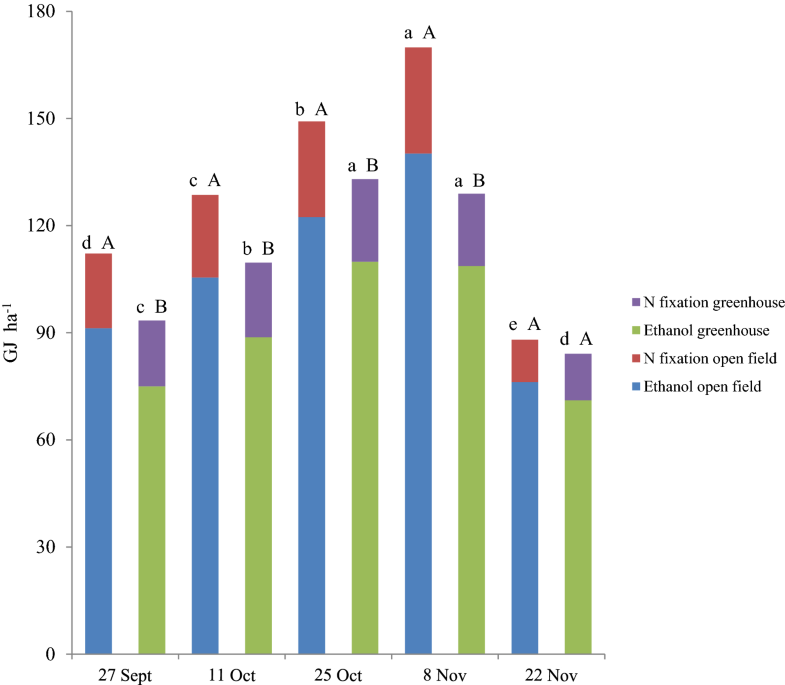 The broad bean theoretical ethanol yield was significantly affected by the interaction between farming system and planting time (Fig. 3). In open field, the ethanol production increased from the first to the fourth transplant (from 4265 to 6552 L ha−1, respectively) and then decreased to the lowest level in the last crop cycle; under greenhouse conditions the highest values were shown by the third and the fourth transplant (5107 L ha−1 as an average) and the lowest in the first and in the fifth crop cycles (3414 L ha−1 as an average). Moreover, the open field crops always produced higher theoretical ethanol yield than the greenhouse ones, except for the last planting time which did not result in significant differences between the two farming systems. The biomass quality for ethanol production was mainly affected by the total cellulose, which increased with the planting time delay, rather than by the hemicellulose which did not significantly change (Table 3). The theoretical ethanol yield per ton of biomass dry weight also displayed an increasing trend from the first (441 L Mg−1 d.w.) to the fifth planting time (495 L Mg−1 d.w.). However, the theoretical ethanol yield was strictly dependent on the broad bean residual biomass amount (Table 3), the two variables showing similar trends. Consistently with our results, other authors  reported the significant effect of planting time on ethanol production from sweet sorghum, which increased from mid March to late March or early April and then decreased. Moreover, the theoretical ethanol yields shown in our research are comparable with those obtained in previous research conducted on vetch, rye and maize  and much higher than that recorded in tomato . The significant interaction between planting time and crop developmental phase showed that the number of nodules on broad bean roots, containing Rhizobium (identified as Rhizobium leguminosarum biovar viciae) generally increased from the vegetative phase until early fruiting phase and then it remained steady until the crop end (Fig. 4a). Moreover, the nodule number was highest from early to late fruiting with the second to fourth transplant, whereas it was not affected by planting time at vegetation phase. Plant nitrogen uptake (Fig. 4b) did not change between the vegetative and early flowering phases, after which it increased until early fruiting phase under the first, second and latest planting times, and until mid fruiting phase with the third and fourth transplanting. Plant nitrogen per root nodule (Fig. 5) showed the highest values during the vegetative phase, after which it remained constant until the mid fruiting phase and declined at last phase only for the third to fifth planting times. Considering nitrogen fixation could entirely support the plant growth from early flowering to mid fruiting, and that Rhizobium efficiency appeared constant along all crop cycle, both the highest value of plant nitrogen per root nodule and the lowest nodulation during vegetative phase suggest that the plant nitrogen is mostly uptaken by soil fertilizer. This is supported by the fact that plant nitrogen per nodule did not significantly change in different environmental conditions related to plant developmental phases, planting times and crop systems from early flowering to mid fruiting phase. Further, Jensen et al. reported that broad bean post-planting growth needs soil nitrogen availability since broad bean root nodulation takes time to establish. 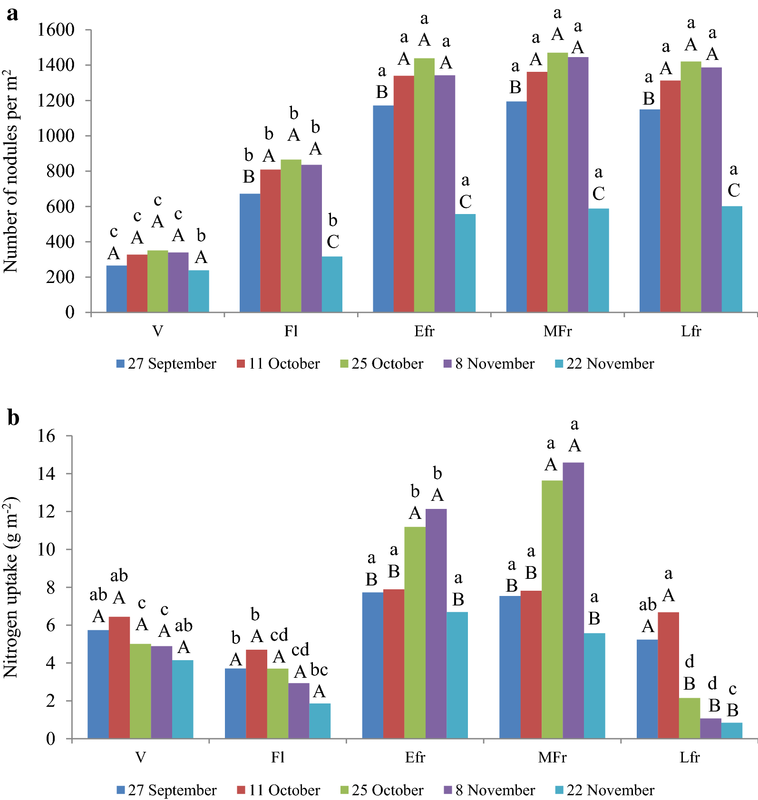 On this basis, during the vegetative phase, the mineral fraction of nitrogen uptake in all treatments was estimated by subtracting from the total plant nitrogen accumulation the aliquot of the fixed nitrogen, the latter expressed as the mean Rhizobium fixation activity from early flowering to mid fruiting phase (from 7.2 to 10.6 mg per nodule, under the second to the last planting time, respectively). As reported in Table 4, the majority of nitrogen absorbed by plants derived from the symbiotic fixation, attaining the highest values with the fourth planting time in open field and with the third transplant in greenhouse, and it was highly correlated with the number of root nodules (r = 0.97 at p < 0.01). The nitrogen gained from bacterial symbiosis ranged from 82.8 to 92.5% under open field management and from 84.0 to 87.6% in greenhouse out of total plant nitrogen, consistently with previous research [52, 53] where this nitrogen source accounted for 60–96%. The nitrogen gained from bacterial symbiosis turned into reduced need of mineral fertilizer supply up to 3.3 and 2.6 Mg ha−1 in open field and greenhouse, respectively. This enables Vicia faba to produce food protein at low cost, which represents a manufacturing energy saving. The overall energy production connected to the broad bean crop systems consisted of: (i) the energy associated to ethanol yield from crop residual biomass, reaching 140.2 GJ ha−1 under the fourth planting time in open field and 109.9 GJ ha−1 with the third transplant in greenhouse, and (ii) the energy derived from symbiosis between plants and Rhizobium, attaining the top level of 29.7 GJ ha−1 under the fourth planting time in open field and of 23.1 GJ ha−1 with the third transplant in greenhouse (Fig. 6). With all transplanting times, the open field cultivation resulted in higher energy production than the greenhouse management, except for the last transplant for which no difference were recorded. The investigation carried out on broad bean, aimed to evaluate different farming managements, showed the improving effects of greenhouse conditions on seed protein content compared to open field. However, the latter crop system enhanced polyphenols and ascorbic acid accumulation in the seeds. 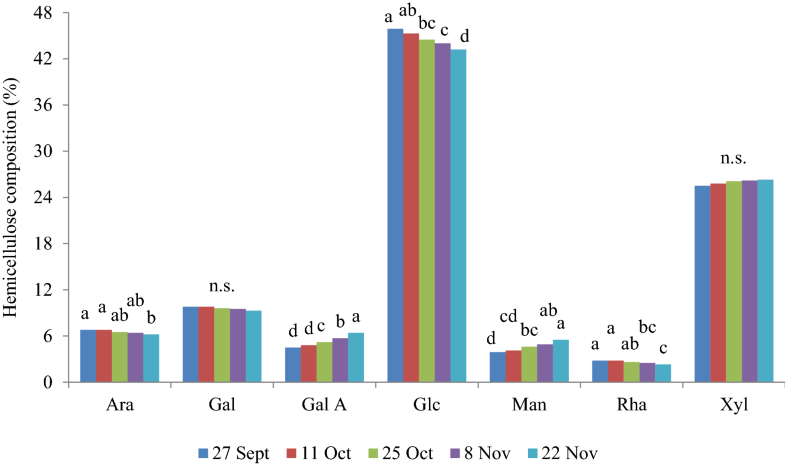 Open field also increased cellulose in the biomass residues after pod harvest, which resulted in the highest ethanol yield under the 8 November transplant. 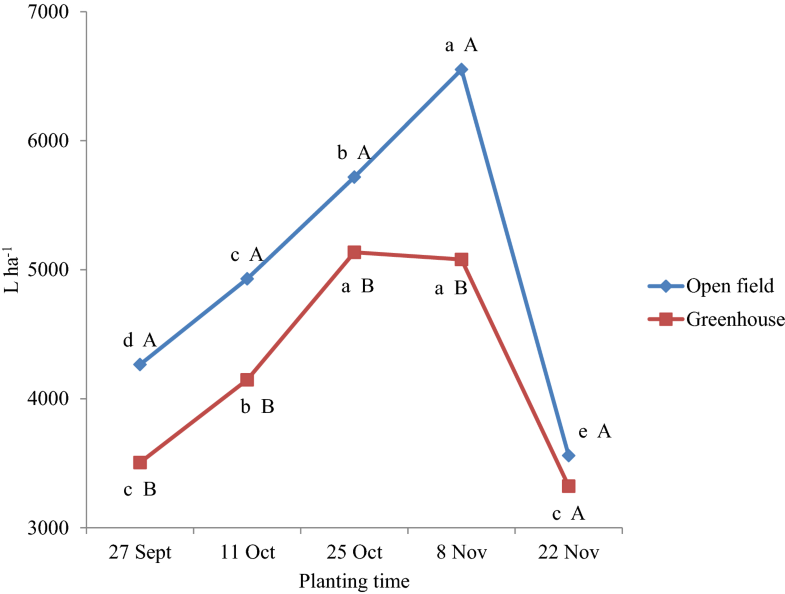 The most efficient symbiosis between Rhizobium and broad bean plants was recorded at the mid-autumn planting times, 25 October and 8 November, allowing to gain an important amount of energy connected to nitrogen fertilizer saving. From our research, it can be inferred that the appropriate combination of farming system and planting time enables to valorizing the overall broad bean production process. CA was involved in seed chemical analysis, data interpretation, and manuscript writing; LDG interpreted chemical analysis of residual biomass and took part to manuscript drafting; PF addressed plant–Rhizobium relationships and contributed to manuscript drafting; SDP was involved in the experimental design setup and manuscript critical revision; OP supervised Rhizobium analysis and relevant interpretation; RS performed chemical composition assays of residual biomass; VV performed Rhizobium determinations and relevant processing; DA was involved in seed chemical determinations and relevant processing; CB contributed to seed chemical analysis and residual biomass sampling; SJMM critically revised the manuscript; GC conceived the study and was mainly involved in interpretation of data and in manuscript writing. All authors read and approved the final manuscript. The authors wish to thank Dr. Stefano Conti, Mr. Roberto Maiello, Dr. Giuseppe Melchionna, Dr. Giuseppe Morano, Mr. Rosario Nocerino, and Dr. Silvano Somma for their assistance with the field and laboratory equipments. Additional data may be available on request to the authors, please contact corresponding author. All authors agree for submitting this manuscript to Chemical and Biological Technologies in Agriculture. The authors declare that this study does not involve human subjects, human material and human data. This research was part of the BIOMASSVAL project funded by the Ministry of Agriculture and a short-mobility grant was provided by the University of Naples Federico II for carrying out analyses at the Department of Biology of York University (United Kingdom). ISTAT. Annual crop data. Istituto Nazionale di Statistica, Rome, 2017. http://dati.istat.it/Index.aspx?DataSetCode¼DCSP_COLTIVAZ&Lang#.